Updates to Sherryl's profile since your last visit are highlighted in yellow. I have worked as far north as La Ronge; as far west as Vancouver; no further south than Regina, and no further east than Saskatoon. I have worked as; waitress, chambermaid, hair stylist, cabinet finisher, receptionist, clerical worker, office manager, labour market analyst, and now legal assistant. Who says you have one career in a lifetime? lol :) I've travelled all over Saskatchewan, some AB, some BC, Some MB - am hoping to get to the rest of the country at some point, and hopefully, some where tropical - at least once. Best things that have happened to me, is the birth of my son in 1985, and my marriage to my soulmate, Harvey in 1993! Sherryl Baumfeld Neufeld has a birthday today. Sherryl Baumfeld Neufeld changed her profile picture. Sherryl Baumfeld Neufeld added a photo to her profile gallery. 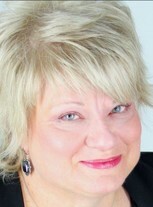 Sherryl Baumfeld Neufeld updated her profile. View. Yes, I still have the old freshie beanie! Christmas 2007 - This is Harvey, my son Matthew, and his girlfriend Tammy! Being greeted at the door!